The killing of Cecil the lion upset a lot of people. It upset me. I didn’t call the dentist a murderer though, being a bit of a speciesist myself and reserving that word for the wilful killing of our fellow humans. Other words sprang to my mind- arsehat, creep, psychopath- but not murderer. Serial exotic animal killer Rebecca Francis leapt to the dentist’s defence by publishing a photo of herself smiling above a giraffe she had killed and saying some words about how wonderful she felt at the moment the gentle giant died. She added that she had honoured the noble beast as she killed it either with a high velocity rifle or that weird bow and arrow thing that looks like it was designed by NASA. This twaddle about honouring animals that die for us gets said surprisingly often. It even gets said by people who don’t actually physically kill animals. Some Buddhist monks say that as long as you didn’t actually kill the animal yourself it is all hunky dory. There is also a school of thought that by cooking your steak with love you are honouring the animal that has died for your meal. That really is prime cut, unadulterated tripe. Whatever we are feeling and however much honour is in our hearts and however much we avoided pulling the trigger or slicing the artery, the animal remains dead. Our honouring counts for, let me see….umm…nothing. Zip. Talk about an inflated sense of ourselves. “Ah, but animals kill each other to survive and we are just another animal so we are honouring our place and the animal’s place in the circle of life,” says an imaginary person arguing with me. “Well,” I reply imaginarily, “then do it like a lion or a cat or a snake.” This is a smartarse answer and I know it. Of course you can’t do that. Neither can I. That would require fang and claw or a sac of venom and patience and courage, none of which I possess in carnivorean quantities. This is because I am not an actual carnivore. I may be an omnivore though looking at all my body bits I doubt it. But even if I am an omnivore I happily do not have to eat animals. This is a relief as I feel bad when I see an animal killed. I felt bad about old Cecil and I felt bad about that giraffe who was so honoured in its death photo, its sad lifeless neck draped around the leg of the sunnily smiling Rebecca. That photo screams respect. For some reason the photo that made me most angry was the one of Dr Palmer, stripped to the waist and all bulging biceps, holding up a limp leopard he had shot. That photo can break your heart. It is a photo of the moment when Dignity was slain by Narcissism. It could be called The Death of Hope except that it isn’t because we can’t help hoping. And there is good reason to hope. The callous killing of Cecil opens a door. There is worldwide revulsion at the idea of the noble beast as unwitting gladiator in a rigged fight. Yet, when we think about it, there is nothing inherently worse in the killing of Cecil than there is in the killing of Penny the piglet for our morning bacon. Some say that it is worse to kill Cecil because he is endangered. This is falling for the same logical mistake as Rebecca Francis. If the only value that Cecil’s life has is the value we put on him as noble or endangered or some other label, then our outrage is for us, not Cecil, and he remains expendable to someone who sees value in his death. I don’t think we are revolted because lions are endangered. Our reactions are instant and powerful. I think we can see the horror of what happened to Cecil and the giraffe because we are free of the guilt of being associated with it. We don’t eat lions and giraffes. We are free to see Cecil as himself. This is why the US tonight show host Jimmy Kimmel can ridicule vegans one week but the next literally cry for Cecil. He doesn’t distance himself from Cecil and his reaction is one of love. 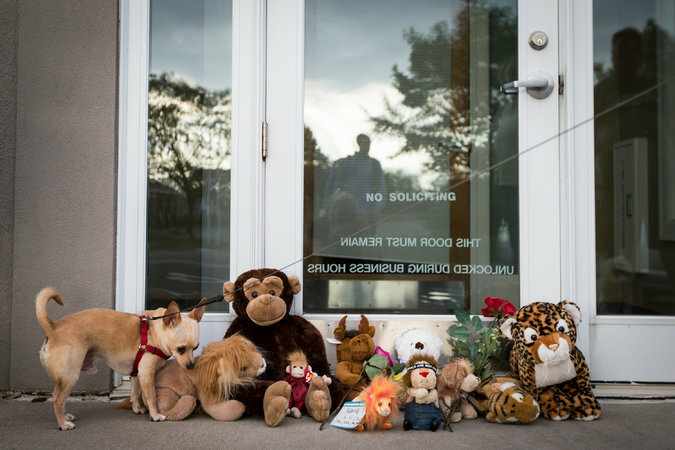 We read with sadness that Cecil had cubs and our hearts reached out to them. We are free to think of Cecil as a being with feelings and connections, like ourselves. We like him. We do not think this way about Penny the pig, yet she surely is as dignified and as capable of love as Cecil. Outside of our labels they are equals in love, dignity and the ability to feel pleasure and pain. This is where Cecil can lead us. He has planted in our hearts a realisation that most of us feel a kinship with animals and do not like to see them suffer. His death was unnecessary. Even if we take the view that we have a right to kill other species, we want that killing to serve a pretty pressing purpose. Now it is just a short step to see that Penny the pig and Sammy the steer and Charlie the male chick aren’t any different and that their deaths and mistreatment are no more essential for us than Cecil’s.